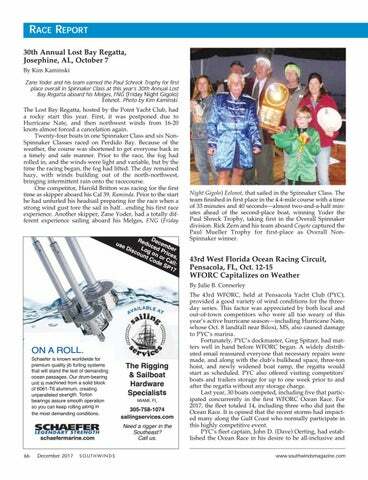 RACE REPORT 30th Annual Lost Bay Regatta, Josephine, AL, October 7 By Kim Kaminski Zane Yoder and his team earned the Paul Schreck Trophy for first place overall in Spinnaker Class at this year’s 30th Annual Lost Bay Regatta aboard his Melges, FNG (Friday Night Gigolo) Eelsnot. Photo by Kim Kaminski. Night Gigolo) Eelsnot, that sailed in the Spinnaker Class. The team finished in first place in the 4.4-mile course with a time of 33 minutes and 40 seconds—almost two-and-a-half minutes ahead of the second-place boat, winning Yoder the Paul Shreck Trophy, taking first in the Overall Spinnaker division. Rick Zern and his team aboard Coyote captured the Paul Mueller Trophy for first-place as Overall NonSpinnaker winner. ON A ROLL. Schaefer is known worldwide for premium quality jib furling systems that will stand the test of demanding ocean passages. Our drum-bearing unit is machined from a solid block of 6061-T6 aluminum, creating unparalleled strength. Torlon bearings assure smooth operation so you can keep rolling along in the most demanding conditions. 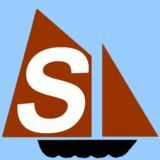 305-758-1074 sailingservices.com Need a rigger in the Southeast? Call us.